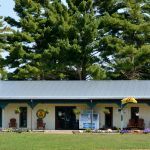 Ask fellow campers about "Andover / Pymatuning Lake KOA" and nearby attractions. Wifi was not to good. Hook-ups are not set up for a motorhome - very confusing which hook-ups are yours. There are not enough for all sites. Dog park is not small dog friendly - big gaps around the gates. Close to Pymatuning Lake. We will be back. We camped at Andover / Pymatuning Lake KOA in a Motorhome. It was 30 min to Ashtabula (Lake Erie), 5 min to Pymatuning Lake (fishing, boating). This resort is now part of the KOA system and is found as Andover/Pymatuning Lake KOA on their site. While the Pymatuning Adventure Resort sign still remains it is dwarfed by the new KOA signage and other markings. As other reviews have mentioned there were once far more amenities at the resort (water park, two pools, tennis, etc.). Most of these have been removed and what remains is very basic. The outdoor pool is rather small and situated poorly on the property. All of the buildings and facilities have a very worn out and "has been" feel to them. Our biggest complaint is however the absolutely horrible condition of the roads and sites. In fact, "sites" is a generous term. Each spot is really just a path worn into the grass with some very sparse remnants of gravel. The streets are extremely narrow - just barely wide enough for two passenger vehicles to pass one another. The driveways into the sites are shockingly slim and are bordered by 8-12" deep drainage ditches on both sides. Our site was shamefully unlevel. It took all of the pads, blocks and other leveling equipment we could muster to get even close to level. As there is no real support underneath there was also significant settling over the course of our two day stay. Others have mentioned that the power pedestals and water connections are shared between four sites. We had more than a 35' reach to get to power and water. Thankfully we consulted this site before arriving and had spare water hose and electrical cable aboard. Without these we would have been unable to connect. While we hope that the new relationship with KOA will help improve the conditions at this park, it will likely take significant time and large sums of money to bring this tired, too long neglected park back up to some reasonable standard of comfort and accessibility. We sadly cannot recommend it and would very strongly suggest you consider staying elsewhere. We camped at Andover / Pymatuning Lake KOA in a Motorhome. Pontoon boat rentals are available very close by. We visited Pymatuning Boat Livery and rented a 29' boat for half a day. It was a fun way to see the lake and to spend an afternoon on the water. Restaurants in the area are virtually nonexistent. Are members of Travel Resorts so stay was free. Large grass spaces. Relatively level large sites. Pool is reasonable size and clean. Lifeguard and pool toys for the kids. WiFi signal was OK at our site. Well stocked camp store. We camped at Andover / Pymatuning Lake KOA in a Motorhome. Bathrooms are a bit run down, but clean. Grounds are clean and well maintained. Old water works and the indoor pool is removed, but the outdoor pool is renovated and nice. Park staff is excellent. Wifi is poor. 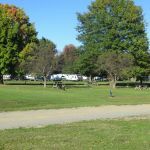 We camped at Andover / Pymatuning Lake KOA in a Travel Trailer. Bring a conversion cable. Each site is amp specific. Price reflects TRA membership. This is our third year visiting this campground. Three years ago our grandchildren had a ball; indoor & outdoor pool, paddle boats, miniature golf and even a water park. Last year, as reflected in the previous review, everything was gone except the outdoor pool. This year the outdoor pool was closed for repairs there is absolutely nothing for families to do. Needless to say we will not be returning. We camped at Andover / Pymatuning Lake KOA in a Motorhome. PRO’S: Nice large sites - very deep and wide. Sites are grass and gravel. Many open, unshaded sites as well as some shaded. Clean restrooms and showers. Nice playground area for the kids. Nice pool. Good water pressure. The grounds staff was friendly and helpful. CON’S: There used to be a nice water park that was part of this campground. We camped next to friends who camped in their TT with their young children. Imagine our surprise when upon our arrival we found that the water park was no longer there! It was bulldozed and removed this past spring. We were never told that the water park was no longer there when we booked our sites! The water park was one of the main reasons that we choose this park for this particular weekend destination. When booking my site, they asked about my rig and I specifically told them that it was a 40 ft MH, 50 amp, two slides, and I preferred an open, unshaded site for satellite reception, if possible. They said that it was no problem, but they didn’t have 50 amp, only 30 amp. Upon arrival, the site that was assigned to me was one of the few sites that contained a large willow tree. So large that I couldn’t fit my rig into the site without hitting several limbs. Upon notifying the office, they simply assigned us to a different (open) site. Upon hooking up, we also discovered that the sites did in fact have 50 amp service as well as 30 and 20 amp. If visiting this campground, be sure to bring a Lot of extra water hose, sewer hose, and power extensions. The hook ups are very far to the rear of the sites. Depending upon where you position your rig in the site, you could be approximately 30 to 40 feet from the hookups! Fortunately for us I carry a lot of extra lengths of hookup extensions for just such an occasion. Management really needs to revisit training of their office personnel. It seems that they have little knowledge of the campground sites and amenities for which they are booking. Now that we know what to expect, we might consider staying there again, mainly due to the extremely large, open sites. However, if there is an alternative nearby, we may look elsewhere. We camped at Andover / Pymatuning Lake KOA in a Motorhome. We are members of Travel Resorts so had $0 rate. Stayed 3 nights. Nice pool, clean restrooms. Would stay again. We camped at Andover / Pymatuning Lake KOA in a Motorhome. We stayed as Coast to Coast. Check-in staff were friendly and we didn't have any problems. The sites were of ample size and relatively level. The pads were gravel and the yard area grass. The grounds were well manicured and several renovation and upgrades were in progress at the time we were there. They have an indoor pool, sauna room and an outdoor pool. Also on the property is a water park; this was also being renovated. The restrooms were always clean, however they are somewhat dated. There is gated security at night and a restaurant on site. We would stay here again. 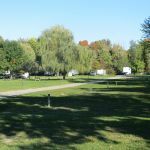 We camped at Andover / Pymatuning Lake KOA in a Motorhome. We stayed here free with our ROD membership. The main purpose of this review is to let people know that they now have some 50 amp sites available. The park was recently purchased by a new owner. 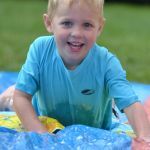 Money is being spent on upgrading the water-slide park. The park has a nice indoor and outdoor pool, and several nice cabins. Most sites are grass, but there are some gravel sites. They also have a restaurant on site (Maui Mikes) that has good pizza. We would stay here again. We camped at Andover / Pymatuning Lake KOA in a Fifth Wheel. We stayed here as a guest of a Coast to Coast member, so the price was $15 per night. I don't know if non-members can stay here unless they are coming for the sales pitch. Very family friendly and dog friendly. There is a water park and nice indoor and outdoor pools. Many other activities and options. The grocery store in Andover is indeed very nice. Restrooms and showers were satisfactory but could use some updating. Campsites are spacious and there is a mix of full sun and partially shaded sites. If in the area again, would consider the state park or possibly the Bayshore campground in Andover to be on the lake. We camped at Andover / Pymatuning Lake KOA in a Motorhome. Very nice park near the Pymatuning Lake. Very large sites. Would definitely return to this park. We camped at Andover / Pymatuning Lake KOA in a Motorhome. 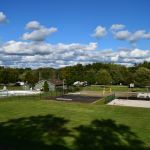 Are you affiliated with Andover / Pymatuning Lake KOA ?